Last Saturday’s victory over Stalybridge means that Chester has completed 12 months unbeaten at home for the second time since the club was reformed in 2010. In fact the Blues have only been beaten once at the Exacta since December 2010 when Radcliffe Borough won 3-2 in the Evo-Stik North. Hednesford Town are the only side to take all three points away from the city, on January 21 last year, and this has prompted Chester to embark on an unbeaten sequence that currently stands at 25 league and cup games. The run started with a 2-1 league victory over Mickleover Sports when Alex Brown and Matt McNeil found the back of the net. Since then only Bradford Park Avenue and Northwich Victoria have avoided league defeat at fortress Deva while both Halifax and Worksop secured replays in cup competitions. This gives Chester an impressive home record of won 21, drawn four and lost none over twelve months. This series is currently two short of the sequence set between January 2011 and January 2012 when the Blues went 27 league and cup games unbeaten. On that occasion the overall record was won 20 drawn seven and lost none. Excluding cup games, the Blues are currently unbeaten in 22 home league matches with 20 victories including the last 9 outright since the 1-1 draw with Bradford Park Avenue in October. In the previous sequence, there were 25 league matches featuring 18 wins. The best unbeaten home sequence in league and cup games was set in the 1970s. Between November 1973 and January 1975 Chester were unbeaten in 35 games. The run started with a 1-0 FA Cup victory over Telford United and ended when Rotherham won 1-0 at Sealand Road in a Division Four game. This sequence covered 27 league games, two FA Cup ties, five League Cup victories (including the 3-0 win over League Champiomns Leeds United) and one Welsh Cup tie. If you only look at league games the record is 44 unbeaten games between August 1925 and September 1927 when Chester competed in the Cheshire County League. In addition, between November 1907 and October 1908 Chester won 13 consecutive home league games which is the best home league winning sequence. Prior to the 3-2 defeat at Boston United in September the Blues reached 23 unbeaten league games home and away so this Chester FC record is already under threat. The 4-1 win over Stalybridge was the 19th unbeaten game so, subject to the weather, this record will be beaten if defeat can be avoided in the fixtures up to and including the home game with Gainsborough Trinity. As mentioned in previous articles the overall club record is 31 games in the Combination between January 1908 and March 1909. 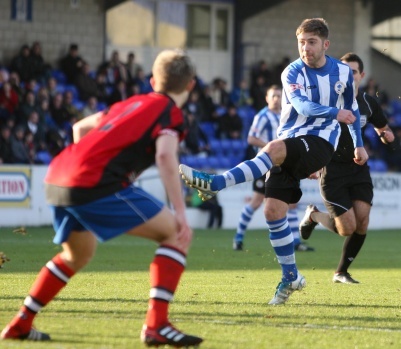 The unbeaten home record has seen Chester score 65 goals and concede only 17. Amongst this total there has been three hat tricks. Chris Simm scored three against Marine, on the day the Championship Trophy was presented, while Ben Mills scored three against Guiseley and Craig Curran claimed a trio against Bishop’s Stortford. Craig’s treble is unique in that it made him the first Chester player to come off the substitute’s bench and score a hat-trick. While writing this Friday’s Leader article I checked back through the records for Chester’s biggest away win and was surprised by how far I had to go back to find an away league victory by a similar margin. Here are some associated statistics. The 6-0 win at Hinckley United was Chester’s first ever game in Leicestershire and equalled the highest score for the newly reformed club. The Blues have won 6-0 on three previous occasions. North Ferriby United were the last side to suffer a similar defeat with Chris Simm scoring a couple and Bradley Barnes coming off the bench to score his last Chester goal back in September 2011. Simm also scored a brace on his Chester debut when Ossett Albion were hammered 6-0 in January 2011 with Michael Wilde scoring a hat-trick. In addition, Wilde grabbed three in the memorable first Evo-Stik North game at the Exacta when Trafford were on the receiving end of a 6-0 thrashing. You only have to go back to September last year to find the last time Chester scored six away from home when this Saturday’s opponents, Stalybridge Celtic, were overwhelmed 6-2 at Bower Fold with Iain Howard scoring his first Blues treble. The six goal winning margin at Hinckley is the best for the new club surpassing the 5-0 wins at Bamber Bridge and Clitheroe in the first season. 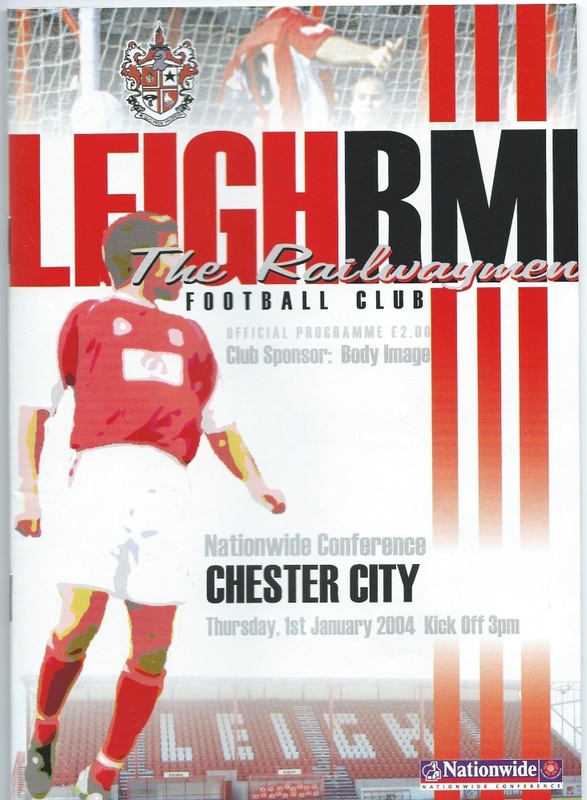 When you look back to the Chester City days the last time six goals were scored away from home in a first team fixture was on New Year’s Day 2004 when Daryl Clare hit a hat-trick (and missed a penalty) in a 6-2 win at Leigh RMI. Darryn Stamp scored twice and Alex Smith added a magnificent sixth in stoppage time in a game where the Blues should have reached double figures. 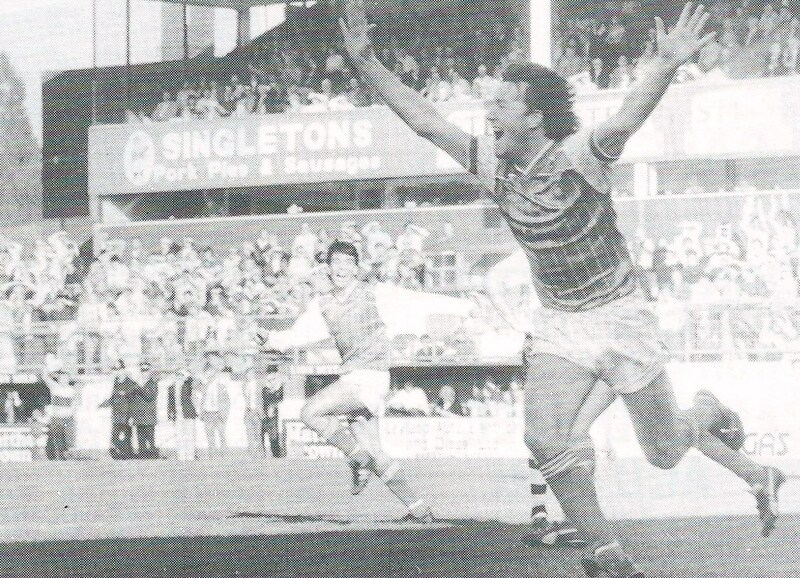 In the Football League the last six goal haul was at Preston when Stuart Rimmer marked his 21st birthday with four goals in a memorable 6-3 victory. Further goals were added by John Kelly and Ricky Greenhough. As far as victory margins go there are two games of note in the last 25 years when the Blues won by five clear goals. During Graham Barrow’s promotion season, in November 1993, Hereford United were overwhelmed 5-0 at Edgar Street. Prior to that Fulham were embarrassed by Harry McNally’s Blues in January 1987 when John Kelly scored twice and Derek Fazackerley made his debut in another 5-0 win. When you start to look for six goal margin wins you really have to dig back through the records. 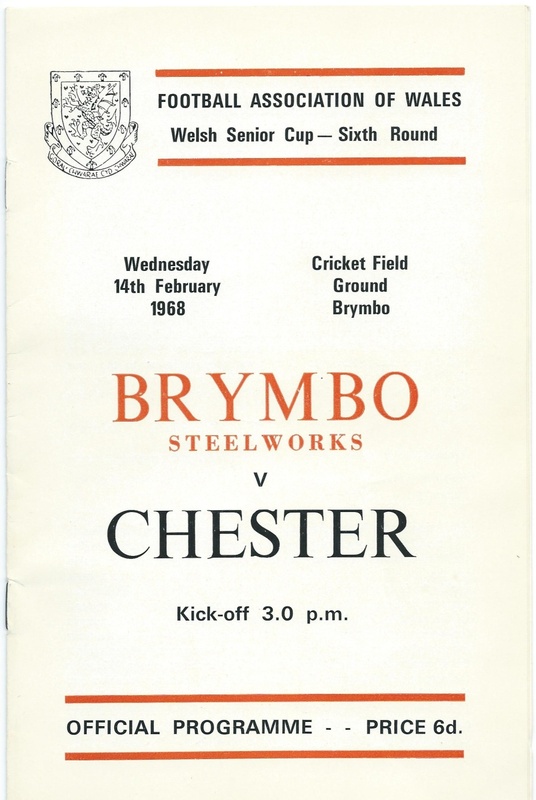 In February 1968 the Blues made the very short journey across the border to play Brymbo Steelworks in a Welsh Cup tie and scored eight times without reply. As far as league matches are concerned, Chester has never won by six goals in a Football League fixture and you need to go back 86 years to the Cheshire County League days to find an equivalent result. In April 1927 Ellesmere Port Town were beaten 7-0 and the same score was recorded at Bacup in 1911/12 and at Connah’s Quay United in 1908/09. This remains the record away league victory.